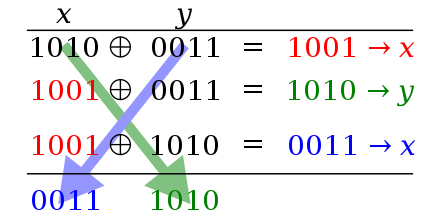 In computer programming, the XOR swap is an algorithm that uses the XOR bitwise operation to swap values of distinct variables having the same data type without using a temporary variable. "Distinct" means that the variables are stored at different, non-overlapping, memory addresses; the actual values of the variables do not have to be different. In the above System/370 assembly code sample, R1 and R2 are distinct registers, and each XR operation leaves its result in the register named in the first argument. Using x86 assembly, values X and Y are in registers eax and ebx (respectively), and xor places the result of the operation in the first register. sets x to zero (because x = y so X XOR Y is zero) and sets y to zero (since it uses the same storage location), causing x and y to lose their original values. Suppose that we have two distinct registers R1 and R2 as in the table below, with initial values A and B respectively. We perform the operations below in sequence, and reduce our results using the properties listed above. As XOR can be interpreted as binary addition and a pair of bits can be interpreted as a vector in a two-dimensional vector space over the field with two elements, the steps in the algorithm can be interpreted as multiplication by 2×2 matrices over the field with two elements. For simplicity, assume initially that x and y are each single bits, not bit vectors. ), which expresses the elementary matrix of switching two rows (or columns) in terms of the transvections (shears) of adding one element to the other. Note that these matrices are operating on values, not on variables (with storage locations), hence this interpretation abstracts away from issues of storage location and the problem of both variables sharing the same storage location. Note that the code does not swap the integers passed immediately, but first checks if their addresses are distinct. This is because, if the addresses are equal, the algorithm will fold to a triple *x ^= *x resulting in zero. in microcontrollers where available RAM is very limited. Because these situations are rare, most optimizing compilers do not generate XOR swap code. Most modern compilers can optimize away the temporary variable in the native swap, in which case the native swap uses the same amount of memory and the same number of registers as the XOR swap and is at least as fast, and often faster. The XOR swap is also much less readable and completely opaque to anyone unfamiliar with the technique. On modern CPU architectures, the XOR technique can be slower than using a temporary variable to do swapping. One reason is that modern CPUs strive to execute instructions in parallel via instruction pipelines. In the XOR technique, the inputs to each operation depend on the results of the previous operation, so they must be executed in strictly sequential order, negating any benefits of instruction-level parallelism. A historical reason was that it used to be patented (US4197590). Even then, this was only for computer graphics. The XOR swap is also complicated in practice by aliasing. As noted above, if an attempt is made to XOR-swap the contents of some location with itself, the result is that the location is zeroed out and its value lost. Therefore, XOR swapping must not be used blindly in a high-level language if aliasing is possible. Similar problems occur with call by name, as in Jensen's Device, where swapping i and A[i] via a temporary variable yields incorrect results due to the arguments being related: swapping via temp = i; i = A[i]; A[i] = temp changes the value for i in the second statement, which then results in the incorrect i value for A[i] in the third statement. Unlike the XOR swap, this variation requires that the underlying processor or programming language uses a method such as modular arithmetic or bignums to guarantee that the computation of X + Y cannot cause an error due to integer overflow. Therefore, it is seen even more rarely in practice than the XOR swap. Please note that the above doesn't hold when dealing with the signed int type (the default for int). Signed integer overflow is an undefined behavior in C and thus modular arithmetic is not guaranteed by the standard (a standard-conforming compiler might optimize out such code, which leads to incorrect results). ^ The first three properties, along with the existence of an inverse for each element, are the definition of an abelian group. The last property is the statement that every element is an involution, that is, having order 2, which is not true of all abelian groups. ^ "The Magic of XOR". Cs.umd.edu. Retrieved 2014-04-02. ^ "Swapping Values with XOR". graphics.stanford.edu. Retrieved 2014-05-02. ^ Schneier, Tadayoshi Kohno, Niels Ferguson, Bruce (2010). Cryptography engineering : design principles and practical applications. Indianapolis, IN: Wiley Pub., inc. p. 251 ff. ISBN 978-0-470-47424-2. ^ Amarasinghe, Saman; Leiserson, Charles (2010). "6.172 Performance Engineering of Software Systems, Lecture 2". MIT OpenCourseWare. Massachusetts Institute of Technology. Retrieved 27 January 2015.